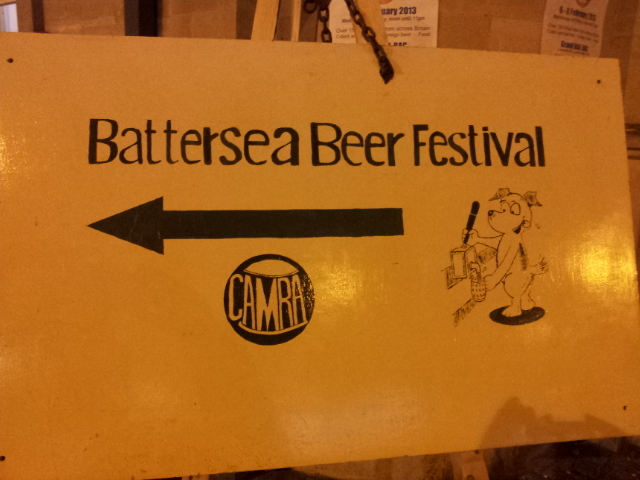 To Start, Battersea Beer Festival…. It was a cold, rainy Friday night. The festival had been on for the last 2 days, this was the final evening. As me and my friend Pat walked past, huddled from the bleak weather, we could see warm, dry people with pint glasses and hear the sounds of laughter and merriment. As we rounded the corner to the entrance, we saw it. A queue. A long queue. That didn’t move for the 10 minutes we waited there. So, as our thirsts overpowered us, we went to the Battersea Mess and Music Hall, just down the road, to have a makeshift beer festival of our own. 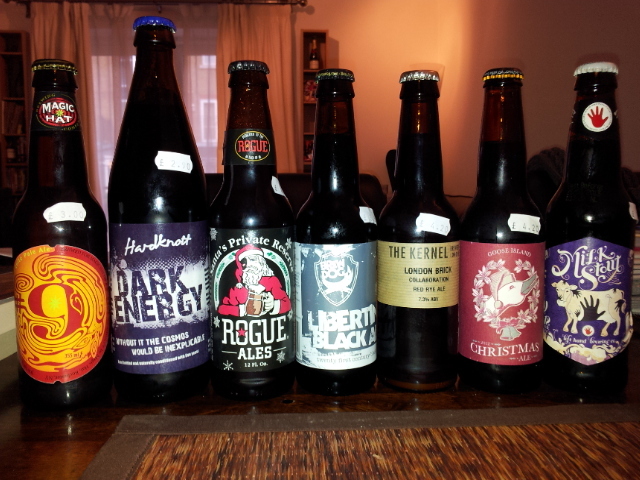 We popped into Eagle’s Wines on the way too as a friend was looking for a wine from a specific Australian vineyard, and I noted that they had a pretty decent selection – BrewDog, Coopers, Little Creatures, Sierra Nevada, plus some Belgians and world lagers. The Battersea Mess is an Antic pub, and pretty typical of their style – dark wood, odd chairs but nicely informal. And they usually have a good selection of beers. Extremely dissapointingly, the had a tap for Moor’s So’Hop but it was off. When a friend inquired as to when it might be back on, he was told that they hadn’t had it for months. They probably leave it there as a ploy to lure in hopheads. We started off with a Sunny Republic Beach Blonde, a Pacific pale ale. We easily found a table, which is always nice on a Friday night, and took a sip. It was a great first drink, light, crisp, a nice hop punch with a smooth bitter finish, and at 3.7%,extremely sessionable. Another friend, Steve, joined us at this point and we all had a pint of Sunny Republic’s Dolphin Amber, which was, as the pumpclip stated, “complex but easy drinking”, however it wasn’t to all of our hoppy tastes. I tried a half of the Pin-Up Beers Milk Stout, which I definitely couldn’t have done a pint of. The very toasted finish was a bit much for me. Still, good to try beers from 2 British breweries that I’d previously never heard of. 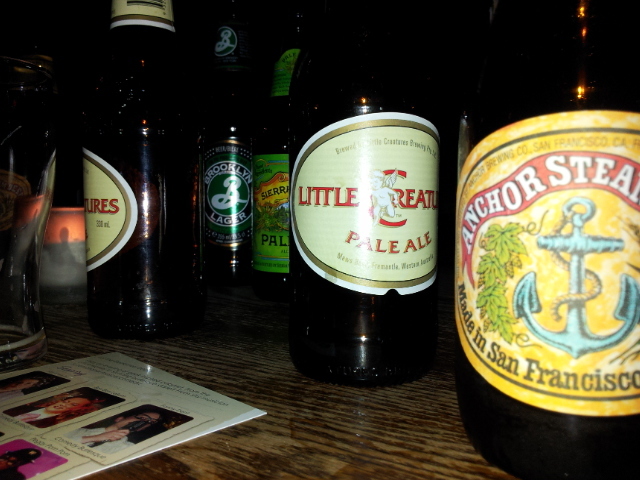 Then we all moved onto the bottles: Anchor Steam, Little Creatures, Sierra Nevada, Brooklyn. All beers with good heritage but ones that I hadn’t actually had in a while because of my thirst for new beers. I also tried the Sierra Nevada Kellerweis, which I enjoyed – nice banana and clove notes with a clean, slightly sour finish. It was good but possibly not what I really wanted that late into the night. We also set up a Twitter account for Steve to do beer reviews based on his tasting notes which I find very amusing as they are written purely for himself and sometimes don’t make sense. We came up with The Sipping Forecast (genius, I know) but I think I just have to persuade him to actually start tweeting. So, I made my way to Brockley, hopped on a train to London Bridge and headed straight to Utobeer where I could happily satisfy my hunger to avail myself of new beers. I’ve had the Dark Energy already, and thankfully it lived up to all the hype I’d heard. And, inspired (and also made slightly jealous) by the number of bloggers doing Christmas countdowns and beery advent calenders last December, I have started to collect some for Christmas 2013. I might as well aim for 12, it’s a fitting number. Pictured are additions 2 and 3 from Goose Island and Rogue. The first one was a Jolly’s Revenge from By The Horns that I got from their brewery bash before Christmas. I very much enjoyed it on tap, lets see what a year in the bottle does to it. And actually, just thinking about it now, I think I’ll aim to have at least one homebrewed beer on the list. Bring on Christmas!